Here is the definitive history of the development of the Colorado River and the claims made on its waters, from its source in the Wyoming Rockies to the California and Arizona borders where, so saline it kills plants, it peters out just short of the Gulf of California. 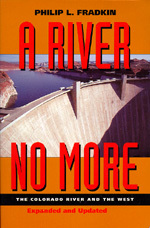 Ever increasing demands on the river to supply cities in the desert render this new edition all too timely. Philip Fradkin has updated this valuable book with a new preface. Philip L. Fradkin is an environmental historian, the author of six acclaimed books on the American West, most recently The Seven States of California (1995). His book Fallout was nominated for both a Pultizer and a Bancroft Prize.